Imogen Collins-Thomas graduated from Bournemouth and Poole College of Art and Design in 1985 after studying Natural History Illustration. A natural history freelance and commissioned illustrator working within the surface design industry, Imogen has also worked as a three-dimensional designer producing drawings and models for bridal head-ware. Her inspiration is drawn from our surroundings, both natural and man-made landscapes, producing both graphic and illustrative images. Biddy Noakes graduated from Hammersmith College of Art with an NDD Honours in Sculpture, and she is an Associate of the Royal College of Art. Biddy has spent most of her career in teaching, being Head of Creative Arts at St James Comprehensive School in Knaresborough for 10 years. She has worked as an Adult Education learning tutor for many years, and for 20 years was a Moderator for AQA History of Art Personal Studies. Throughout her teaching experience Biddy has promoted the importance of the ‘building blocks’ of art and design which allow students of all ages and abilities to develop their own ideas and imagery. She was one of the founders of nidderdale visual arts, and hers was the inspiration to establish number 6 studio gallery. Joan Newall has a first class Honours degree in Textiles and Printmaking and is a Member of the Society of Designer Craftsmen. She began her studies by completing the City and Guilds Embroidered Textiles course at Craven College in Skipton followed by an HNC in Textiles where she gained a distinction. Joan teaches bookmaking and bookbinding, papermaking, machine embroidery and surface decoration to a very high standard. She has taught NCFE levels one and two but now runs private courses and workshops. Joan also runs specialist textile workshops within the community as well as in schools and she believes that teaching extends her own practice which is a continuing learning process. Joan is a member of Page Paper Stitch, a group which specialises in bookmaking and artists’ books and has exhibited regularly at the International Book Fair at Leeds University. She exhibits throughout Yorkshire and Cumbria both with Page Paper Stitch and as a solo exhibitor. Michelle Pilkington is an experienced wire and bead jewellery designer-maker. Michelle has exhibited her work in variety of galleries and her teaching draws on her talented and multidisciplinary background and wide experience in traditional crafts. She has developed her skills over the years, specialising in designing and making contemporary vintage wire and beadwork jewellery which includes the use of clay, silk, paper, glass and recycled jewellery. Current teaching focus on experimental metal work with the emphasis on using recycled tin and copper; this suits students who enjoy developing their work in inexpensive metals transforming everyday accessible objects into unique jewellery pieces before progressing onto precious metals when ready. Gill Kirk is a mixed media artist working with textiles and print. Local to Nidderdale, she is a qualified Outdoor Education teacher, and has a foundation degree in Contemporary Textile Practice. She has a great interest in photography which informs her personal work taking her inspiration from flora and fauna and the local landscape. She exhibits widely across Yorkshire. Gill teaches various forms of fine art printing from screen printing to collographs, plus hand and machine embroidery and contemporary textiles. 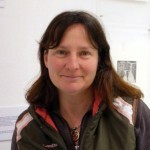 Gill has undertaken residencies with Number 6 as part of the Upper Nidderdale Landscape Partnership Project and she is a regular tutor for the Heritage Skills course run for Year 11 pupils from Nidderdale High School. Moira McTague is a Painter/ Printmaker who specialises in Etching. She is a full time artist, working from her studio in Nidderdale, inspired mainly by her surroundings and the natural world. She exhibits widely. 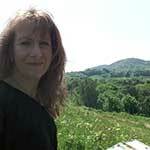 She also has a background in Education and is an experienced tutor, working at all levels from beginners to advanced. As a tutor, she is passionate about passing on skills and processes and believes that everyone can produce creative art work. The courses she leads are thoroughly grounded on teaching techniques and processes so that students achieve the best results possible and develop their own ideas in a welcoming and supportive environment.